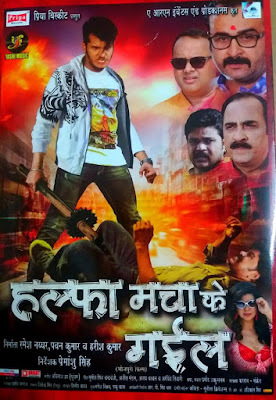 Halfa Macha Ke Gail is an upcoming Bhojpuri movie directed by Pramashu Singh and produced by Pawan Kumar, Harish Nayar and Ramesh Nayyar. Halfa Macha Ke Gail is Drama, romantic and comedy movie. lead roles are Raghav Nayar, Shipra Gaud, harish Kumar, Prem Chopra, Awdhesh Mishra, Smarth Chaturvedi, Manoj tiger nad others.